Beginning with his memorable draw against Gray Maynard on New Year's night, 2011, and ending with his decision loss to Jose Aldo on Feb. 2, Frankie Edgar fought 24 rounds over five fights. There are no official records kept for "most rounds fought over a 25-month span," but the former UFC lightweight champion is coming off a stretch as active as any fighter in company history. Only current flyweight champion Demetrious Johnson, who logged 27 rounds from Feb. 2011-Jan 2013, springs to mind as someone who has done as much in a similar stretch. Even workhorse welterweight champion Georges St-Pierre has never logged as much Octagon time over such a span. But as far as the 31-year-old Edgar (15-4-1) is concerned, "more is better" is a mantra he'll follow as long as he fights. "I could go five rounds right now if I wanted to," Edgar said in a recent phone interview with Yahoo! Sports. "That's the only way I know. I want to fight in the main event and I want to go 25 minutes. That's how I train and that's how I want to do this sport." The topic of accumulated ring time came up for a reason: When Edgar returns to the Octagon to meet Charles Oliveira (16-3, 1 no-contest) in the featherweight co-feature bout of UFC 162 in Las Vegas on July 6, it will mark the first time the pride of Toms River, N.J. will compete in a scheduled three-round fight since 2009. Each of his past seven bouts were slated as five-round affairs. Even then, though, a 15-minute fight was accepted with reluctance. "I wanted to fight on a television main event," Edgar said, as headline non-title fights are scheduled five rounds. "That's what I was pushing for, but sometimes the way things work out, you don't get what you want. I want to stay active and keep fighting and this was the opportunity which was in front of me, so I took it." Against Oliveira, Edgar is the clear-cut favorite. But the former champ understands he's facing a live underdog. The 23-year old from Sao Paulo is 2-3 with a no-contest in his past six fights. But Oliveira retains the lethal finishing skills which helped vault him to a 14-0 career start. Fifteen of his 16 career wins have come by finish, with nine submissions and nine knockouts. "I've got to take this guy seriously," Edgar said. "Maybe he's not as big of a name to the fans as some of the guys I've fought like B.J. [Penn] or Jose, but he's a guy who's made people who underestimate him pay. I've got to respect his submission skills." Besides, Edgar knows the flip side of this: Oliveira can make his name in a hurry with a finish of the former champion. "It's kind of funny that I'm in this position," Edgar said. "It's kind of like when I was on my way up and I was fighting guys like [former UFC lightweight champion] Sean Sherk. I guess it's a compliment in a weird way, it shows what I've done in this sport. But that just gives me more motivation to make sure [Oliveira] doesn't get there, doesn't take it from me." 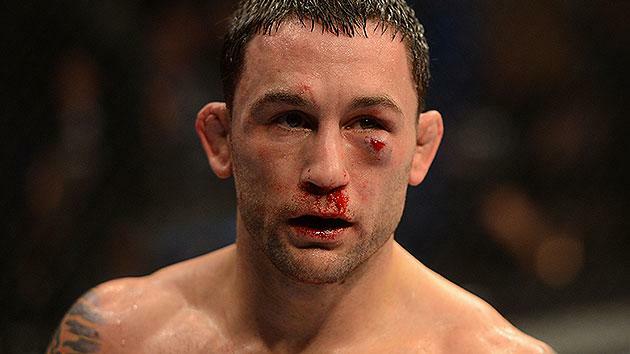 The bout comes at a crucial time in Edgar's career. The fighter known as "The Answer" made a career out of dancing along the margins. His ability to stick and move helped him take a decision from B.J. Penn to capture the lightweight title at UFC 112 in April 2010, then repeat in the rematch four months later. It also helped him barely retain his title in the split draw against Maynard in the aforementioned 2011 bout. But there's an old adage about living by the sword. Edgar is 0-3-1 in his past four fights which have gone the distance. This includes his title loss to Benson Henderson at UFC 144, and a split-decision loss in their UFC 150 rematch, a verdict which was almost universally viewed as highway robbery. "I can't look back, man," Edgar said. "I can only keep looking forward." The loss to Aldo in February was another close shave. Most observers felt Aldo took the first two rounds and Edgar the last two. Enough people felt Aldo got the better of a close third round to swing the fight in his favor. While no one is saying Edgar is past his prime, and his quality of opposition speaks for itself, Edgar understands a victory in this spot is imperative. "I'm not going to make any excuses," Edgar said. "I'm also not going to do anything different. The fans are going to see the same Frankie Edgar everyone has always seen, and I think that will be enough to get the job done." The bout marks Edgar's second since dropping down to 145 pounds. This came, of course, after years of fighting without cutting weight as an undersized lightweight; but some in his camp insist he could cut down to bantamweight if needed. Edgar, for his part, feels featherweight has become his home. Unless the right opportunity came knocking. "I feel like this is where I belong right now," said Edgar. "I'm comfortable here. I wouldn't say no to going up or down, if the right opportunity came up, because getting the chance to fight my way to a championship is why I got into this sport. I wouldn't rule anything out but for now I'm good where I am."